The first group that I know called the Peaches was the from the mid 50s one out of which Etta James emerged to a glittering solo career. This group from the 60s is a different one from the one that Bumps Blackwell recorded in New York for his own Bumps label, but may well be related to the one that cut for Constellation in 1966, since this lovely femme ballad also came from the Windy City. In My Heart has a delicate melody and gently subtle arrangement, especially from the lovely electric piano, but lead singer Brenda Lee Eager really gets down, singing with power and some great gospel flourishes. I love the occasional tenor sax fills as well. The other sides that the group recorded for Mercury came out under Brenda Lee Eager's name. UPDATE ~ David Cole (see Links) kindly writes to say that in his interview with Brenda Lee Eager she gave the names of the women in Peaches as Mattie Butler (Jerry's sister), Diedre Tigs and Carolyn Johnson. Davie Gordon has written to confirm the group members and by reference to an interview with Jerry Butler in Blues & Soul in 1972 adds that Butler said ""I formed the group about two years ago because I found I needed to use background singers all the time and that if I were to use the same girls all the time I could create a definite sound." So Davie says that the group on Constellation must be a different group. I have consequently removed that 45 from the discography. 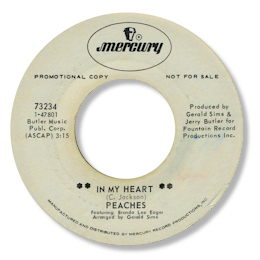 Note ~ Mercury 73234 is the only 45 credited solely to Peaches. Brenda Lee Eager's Mercury 45s feature the group but they are not given full credit on the labels.